There are many, many sites and information sources out there covering digital marketing developments and many, many tools and other methods to keep up to date with what's happening in the fast paced digital marketing world. It's essential for employees to keep up to date, for the sake of the business they work for and for personal development. 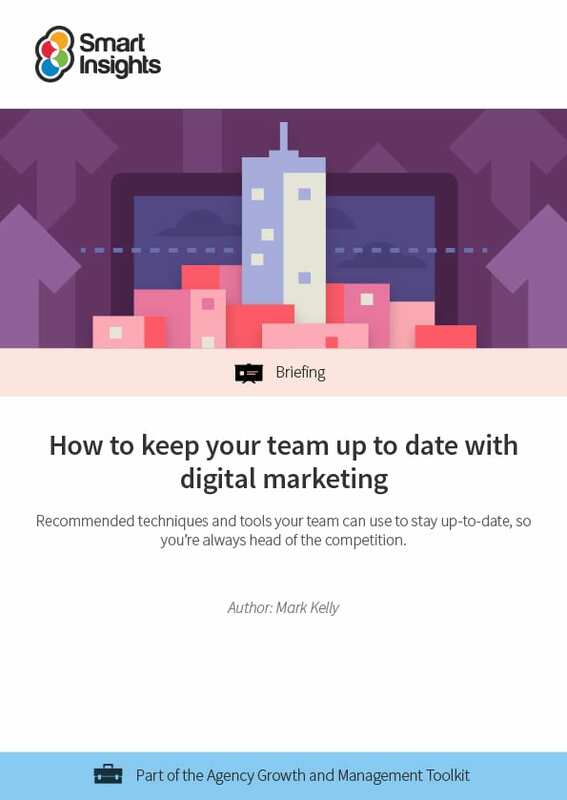 Marketing agency consultant Mark Kelly has created this guide to help managers ensure their teams keep up-to-date with the latest in digital marketing. It's tailored to Mark's experience with what agency teams need to know, but we've made sure it also applies to other types of client-side marketing team too. The guide is also useful for agencies since teams need to be ahead of what's happening, so their clients can always get the latest thinking and trends. We have created this guide for creative agencies, marketing agencies or managers of marketing or digital marketing teams. It’s particularly relevant for managers who may be new to digital marketing and all the technologies, techniques and creative approaches available. It's also for those who are looking for a systematic approach to keep up-to-date. And importantly, are looking to develop a critical eye for what could be important to focus on. This guide will also provide ideas for keeping on top of digital developments to agencies who specialise in one aspect of digital marketing (for example, website design and build) but want to keep abreast of developments in other areas. Client side marketers may also find this guide useful as a way of keeping themselves and their wider teams up to speed with ‘the new’. Why should agencies keep abreast of what’s new?